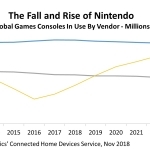 MILTON KEYNES, England--(BUSINESS WIRE)--Nintendo is set to regain its leadership position in video game consoles for the first time since 2009, according to the latest projections from Strategy Analytics’ Connected Home Devices service. The report, Global Game Console Market Forecast , predicts that Nintendo will sell 17.3 million Switch consoles worldwide in 2019, while Sony will sell 17.1 million PS4 and PS4 Pro consoles. Microsoft will remain in third place, selling 10.0 million Xbox One and Xbox One X devices. 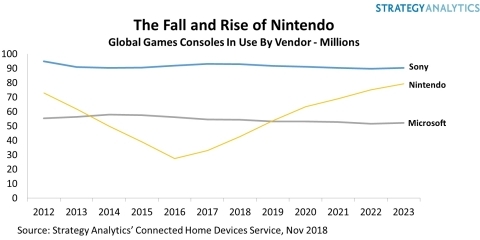 The overall console market has performed well in 2018, with total global sales reaching 46.1 million devices, the highest level since 2010. 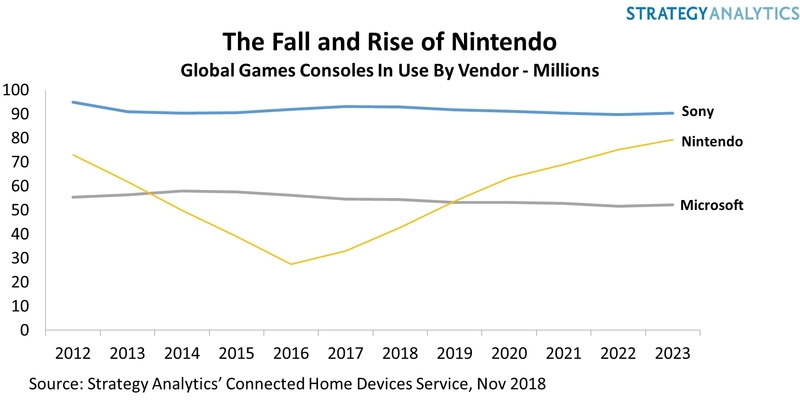 Global Game Consoles in Use by Vendor (Graphic: Business Wire).